We all dream of clear, smooth complexion especially on our face. Often times, we take extra measures to ensure that our skin will remain as pure and clean as possible, but how do we control something when we don’t exactly know what causes it? Melasma is a skin condition wherein patches of brown to grayish discoloration appear usually around the upper cheeks, forehead, chin, and upper lip of women 20-50 years of age. It usually appears on pregnant women, which actually gave birth to its other name “mask of pregnancy". Other factors that researchers point out are frequent sun exposure, use of birth control pills, some medications, genetics, and race. Apparently, people who have darker skin are also more likely to get melasma than Caucasians. Melasma is easily diagnosed by its remarkable pigmentation and distribution on the face. During your consultation, your dermatologist may use a device called “Wood’s Light” to see how deep your melasma runs underneath your skin. On rare cases, dermatologists may also perform a biopsy of skin sample on the area that is affected by the pigmentation especially if you’ve had treatments before but didn’t respond to any. Laser treatments, Hydroquinone creams, specially formulated anti-melasma creams, and dermabrasion are possible treatments for Melasma that our center offers. Hydroquinone creams are skin bleaching creams that are primarily indicated for freckles and for other skin discolorations caused by pregnancy, use of birth control hormones, and skin trauma. The drug works by inhibiting enzyme reaction with skin. For first time users, it is highly recommended to thinly apply the cream on clear skin first and watch for any reaction such as redness or itching to make sure the cream will not cause any allergic reaction. Should there be any unpleasant reaction, stop using the cream and contact your dermatologist. Should there be no notable reaction, you can start applying the hydroquinone cream as directed to the area you want to treat. Sun exposure should be limited and if possible avoided while on hydroquinone treatment. For Laser Treatments, we offer pigment-specific laser devices that lighten the discoloration caused by melasma. Laser treatments work by breaking up the pigment on the skin. Since there are several options for laser treatments for melasma, our dermatologist may recommend one depending on the type of your melasma as well as the type and tone of your skin color. For laser treatments, we recommend at least 3-5 sessions to see if the treatment is working. Sun exposure should also be limited or avoided after laser treatments. 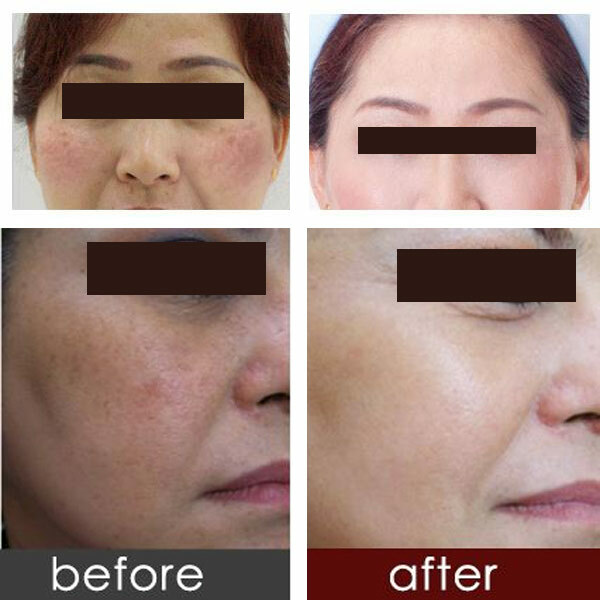 At Yoskarn Clinic, we offer 2 choices of laser program for the treatment of melasma, for instance, our first program will treat all melasma within one treatment, and this will leave a scab which will fall off in 1 week, while the 2nd program will make use of a different kind of laser to gradually lighten the melasma without scab formation. This option however will not completely clear the pigment. The bottom line is that there is still no laser treatment that can effectively control melasma as of this writing. Even if we can remove all present marks, there is no guarantee that there will be no more recurrence. For dermabrasion, this is a surgical procedure that removes the top to the deeper layers of the epidermis to remove skin imperfections. From our long term experience, we developed the “focus dermabrasion” and we found out that this is the only method to cure melasma (means no more recurrence even after sun exposure or the use of female hormaones). During the procedure, your surgeon will use a dermabrader, a small device with an abrasive wheel or brush for a tip to carefully remove the outer layers of the skin to reveal a new, smoother skin. Recovery period is however longer for this procedure because bandages will have to stay in place for at least 7 days after the surgery therefore patients who had undergone the treatment will be required to stay in Bangkok for at least 7 days after the surgery. WHAT RESULT CAN YOU EXPECT? The main aim of medical treatment for melasma is to improve the skin discoloration. Depending on the degree of such, your doctor will recommend a course of treatment for you. The treatments we offer may lighten the discoloration and pigmentation to such a point that it will match your skin color, but there is no guarantee that it will not return again. Dermatologist formulated creams are available in our clinic for maintenance after laser treatment or dermabrasion. These are recommended to minimize the possibility of pigmentation in the case of laser treatment and to balance the color between the treated and non-treated area in the case of dermabrasion. Our head surgeon, Prof. Somyos Kunachak, is one of the authors of Dermabrasion: A Curative Treatment for Melasma. In this study, they found out that dermabrasion, if performed under the right conditions, will cure melasma. Their study is now being used by several dermatologists and cosmetic surgeons for the treatment of melasma. Aside from our surgeon’s expertise, our center also offers assistance in finding good accommodations as we highly recommend Aphrodite Inn. The hotel is situated right beside our center which is very convenient for our patients. The location is also strategic as they are sitting right at the heart of Bangkok’s shopping district with local to high-end brands available within walking distance. For those who are looking into having surgery, the hotel is ideal as our surgeons and nurses will be able to visit you instead of you travelling to get to us. You will also get the benefit of privacy as we provide a connecting door from our patients directly to your hotel so you can come over anytime without stepping outside of the building.